Sister Luma Khudher an Iraqi Dominican sister of St Catherine of Siena has first-hand experience of persecution when she was forced to flee Qaraqosh in Iraq’s Nineveh Plains, after extremists seized the Christian majority town in the summer of 2014. With the rest of her community, she sought sanctuary in the Kurdish capital Erbil, where the Chaldean Catholic Church looked after around 10,000 Christian families. Sadly, 12 elderly Dominican Sisters died in the weeks after they arrived in Erbil. Sister Luma lived as an Internally Displaced Person (IDP) there for more than two years. Her order helped with the pastoral care of displaced families and educating IDP children in Erbil and Dohuk. Aid to the Church in Need helped the Chaldean Church’s emergency aid programme and financed the building of eight schools for the Christian families. The Church was concerned that if education was not provided, then the displaced children would be further disadvantaged after the crisis was finally over. After the Nineveh Plains were liberated in late 2016, her community were among the first to return to repair their destroyed convents in Qaraqosh. 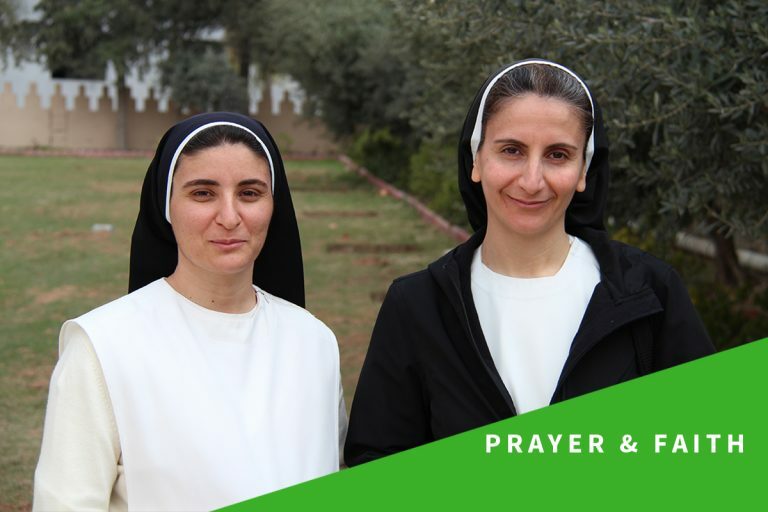 The Sisters continue in their role as teachers –including catechesis – to returning Christians as well as opening kindergartens and a school. The Sisters’ faith and the returning Iraqi Christian families’ resilience provide a message of hope after years of hardship. This Lenten Sunday’s responsorial psalm reminds us that despite the suffering in the Middle East and elsewhere that the Church worldwide is called to “taste and see that the Lord is good” (Psalm 33). ACN benefactors responded to the urgent need of thousands of displaced or refugee Christians and others in need with prayers and by helping with their practical daily needs in Iraq. This Sunday’s psalm presents the Christian challenge to follow Christ’s example by helping others: “When the poor one called out, the Lord heard, and from all his distress he saved him” (Psalm 33). The charity is also supporting the rebuilding of a number of Christian villages – overseen by the Nineveh Reconstruction Committee (NRC), an ecumenical organisation of the Chaldean, Syriac Orthodox and Syriac Catholic Churches. As of November 2018, the NRC has restored 5,746 houses. This year, the charity is funding the continued restoration of the Sisters’ Immaculate Mary Convent and the reconstruction of a further 1,500 houses in Qaraqosh as well as 500 houses in the villages of Bashiqua, Bahzani and Bartella. Grant your people now the grace of returning to those places where the tree of their life is deeply rooted. Grant that this tree may bear fruits of peace and enable your people to restore the honour of your Name in those places you gave to them and to their ancestors, and preserve this land for future generations also, so that the praise of your Name may never cease in their churches and in their families. We ask you this, O God, lover of mankind, through the intercession of Mary, the Blessed Mother of God, of the martyrs of the Nineveh Plains and of all who have borne witness to you by their blood. Amen.